We’d love your help. Let us know what’s wrong with this preview of Destiny by T.D. Jakes. Stepping into your destiny means fu Remember feeling a pull, sensing a divine guide that was leading you to the right place or person? DESTINY, that inner compass, directs you to fulfillment of your highest purpose. When you reflect on your life, you may be amazed that your greatest moments resulted from circumstances that you did not control or initiate. You were destined! Never fails to disappoint. Bishop Jakes has this uncanny ability to see things others can't . In Destiny, T.D. Jakes explores the second important area in discovering your purpose and why you are wired the way you are. This book continues along the lines of Instinct and digs deeper into how to unleash and live in your God given destiny. Bishop Jakes begins the book by sharing how critical it is for us not to hate and despite the small steps needed to take in order to complete our destiny. When we have the proper order, we realize that setbacks doesn’t have to stop us for pursuing our des In Destiny, T.D. Jakes explores the second important area in discovering your purpose and why you are wired the way you are. This book continues along the lines of Instinct and digs deeper into how to unleash and live in your God given destiny. Bishop Jakes begins the book by sharing how critical it is for us not to hate and despite the small steps needed to take in order to complete our destiny. When we have the proper order, we realize that setbacks doesn’t have to stop us for pursuing our destiny. He shared a great example about how God’s blessings at the right time truly is a blessing. If we were to give our small child keys to their brand new car and they haven’t have any driving experiences and training, it would in fact harm our child and others. But if we follow the correct order and are in line with God’s timing, great things can happen. One of my favorite chapters was entitled, “Destiny Is Spelled P-R-I-O-R-I-T-I-Z-E” because this one discussed how crucial it is to prioritize your relationships, finances, what’s important for you, and much more. I loved how this chapter discussed the three different types of relationships people have, “confidants, constituents, and comrades”. This helped me realize where I need to invest my time the most. Finding great confidants who stay with you through the good and bad times are truly an incredible blessing. I also liked how this chapter talked about the power of having a great mind and not letting other’s people’s opinions dictate how we live our lives in pursue of our destiny. Bishop Jakes encouraged readers to not dwell on why people were rude to us or why they lied to us. We need to focus our attention and energy and time on things that truly matter. One of my favorite things, Bishop Jakes revealed was how to deal with jealousy and struggling with envy. He shared a wonderful example of someone running their race and someone else comparing themselves to the other person. If we would build ourselves up and quit being jealous of other people our lives would greatly be changed. He recommended that we need to be inspired and have the attitude that if they were able to achieve their destiny, we can also accomplish ours. I have deeply struggled with being jealous of other people and how fit they are and toned, the amazing job, the beautiful wife, and kids. This book reminded me that I need to focus on running my own race and not to be overly concern about what everyone else is doing. I would recommend this life changing book to anyone who is ready to discover how to step into their God given destiny. Bishop Jakes did an excellent job writing about how important steps are in order to fulfill your destiny and to not hate the process of reaching your destiny. I realized that everything I have been through is not wasted and God will use everything for His glory. This book assisted me in trying to figure out my purpose and how to live in my destiny. I also really enjoyed learning about the actor, film, and TV producer, Tyler Perry and his personal story and how he lived in his true calling and overcame the odds. I’m extremely glad, Bishop Jake included it in this book to inspire others to keep fight towards your destiny. This book will great benefit people who are ready and willing to discover their purpose and destiny. My opinion: Last year, I had the opportunity to review what I would call the companion or first step to this book. INSTINCT was a book I couldn't put down. I ended up purchasing both a print copy and an audiobook version of the book because the words that were written were so powerful. DESTINY followed its example with the importance of the words written and the topics discussed. 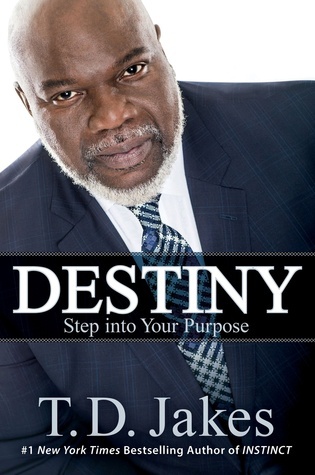 TD Jakes makes powerful arguments for one's destiny and roadblocks that we put in its way. His ability for putting perspectives into BAM moments for reflection was priceless to me. For example, one of the most important parts of the book to me was his analogy of "Every Day is a Withdrawal from the Bank of Time" which was a comparison of minutes wasted each day as money spent/withdrawn from our life bank. This book was loaded with these that just put life into perspective and how life/destiny is wasted. Not being overly religious and a person who tends to avoid faith-based books, what has stood out to me was that the Reverend doesn't come into his books and beat and berate readers over the head with religion. He instead makes logical arguments as how one can support or destroy their destiny or who they are supposed to be with their own actions. I would feel very comfortable recommending this book not only to the religious, but those who live a more agnostic lifestyle. I will say that this book did have more of a reference to God than INSTINCT did, but I did not find it distracting. A "wake-up call" to fulfilling your own Destiny. This book found me at an appropriate time in my own journey. I recommend it to anyone who has especially become lost along the way. I purchased this after hearing T.D. Jakes speak at the Global Leadership Summit. He was one of a handful of speakers whom I found truly riveting, especially since his talk touched on creative arts. Having read this volume -- which is essentially a Christian self-help book -- I have to conclude that Jakes is a better speaker than he is a writer. I don't want to imply that there was nothing of value in this book, but its 240 pages could have been summarized in essay form. Jakes belabors his points I purchased this after hearing T.D. Jakes speak at the Global Leadership Summit. He was one of a handful of speakers whom I found truly riveting, especially since his talk touched on creative arts. Having read this volume -- which is essentially a Christian self-help book -- I have to conclude that Jakes is a better speaker than he is a writer. I don't want to imply that there was nothing of value in this book, but its 240 pages could have been summarized in essay form. Jakes belabors his points to an excruciating degree, and "Destiny" ultimately comes off like a mind-numbing pep rally that drones on for five times as long as it needs to. It is worth noting that Jakes touches on some of the same ideas that Elizabeth Gilbert presents in her book "Big Magic." But whereas Gilbert approaches her subject matter from a secular point of view, Jakes approaches it from a Christian perspective. There's nothing necessarily wrong with taking that tack, but Jakes' theology frequently touches on a thinly-veiled bent towards the dubious so-called "prosperity gospel." And his ideas also share an unfortunate affinity to Rhonda Byrne's execrable "The Secret," with its so-called "law of attraction." TD Jakes has a lot of insight but sometimes the information can get repetitive. I found myself somewhat lost in what his definition of destiny was. Overall it has a great chunk of details for the reader but you have to sift through some tough parts. My wife bought me this at the Global Leadership Summit. It was one of the top three selling books there (which is her criteria for buying me books for my birthday). The book is...awful? I almost don't want to call it that, because I don't think I was the target audience. I think the target audience is someone who needs spiritual motivation; someone who is looking for a rah-rah feel-good type thing. The book is very distinctly spiritual. It's more about personal success (the aut My wife bought me this at the Global Leadership Summit. It was one of the top three selling books there (which is her criteria for buying me books for my birthday). The book is very distinctly spiritual. It's more about personal success (the author, T.D. Jakes, is a mega-church pastor), with a little religion thrown in. I plowed through it in one sitting -- maybe 2.5 hours. The reading is light, but nothing will stay with you. It's all "you can do it!" and "embrace your destiny!" with very limited discussion about obstacles or what might be stopping you. I can't even imagine what person would effectively respond to this. I suspect it sold very well at the conference because T.D. Jakes is a great inspirational speaker, and people who heard him talk want to get that same experience in a book (and maybe they did?). It almost seems unfair to criticize the book. It's...adorable? Innocent? Harmless? This is one of my favorite books of all time. God was speaking to me, so much throughout this book. I was agreeing with TD Jakes and I highlighted, so many sentences. This book helped me to figure out what direction God is going to take me in my life. I of course don't have it all figured out, but that's okay because God knows. I highly recommend this book to everyone. 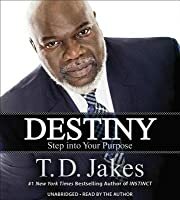 I also recommend you read TD Jakes previous book Instinct because it goes hand and hand with Destiny. Overall, I loved this book and I recommend it to everyone. Chapter 1 of this book sums it up, "Instinct + Purpose = Destiny." Take your time as you read this one. Reflect, meditate, chew and take action to allow yourself to be. You have the power to make a positive difference today. Stay the course and listen to your inner voice. Plan your journey wisely and trust God! I enjoyed this book way more than I expected. Generally speaking, I avoid anything religious but I'd seen Mr Jakes on Oprah Super Soul Sunday and had liked his talk. So I tried this in e-audiobook and ended up finding a lot of interesting information. I may even read it again when I get a bit down or feeling less than optimistic about my future lol. I didn't finish reading the book all the way through. I couldn't get past the fact that in every chapter, in every sentence, he said the word destiny. I felt like I was reading a essay by a first grader where they are taught to repeat the topic in each paragraph. Awesome, powerful book. Full of simple truths that you just forget about in life and sometimes you need a reminder. This one came at just the right time. This was my first T.D Jakes book reading. I am a fan of T.D Jakes talks and thought to read some of his thoughts and I ran across this valuable book. - Defining Destiny as an idea regardless of it's association with the biblical school. - Destiny is completely unique to each an every individual. - God send signs throughout people's lives to help them Hello Readers, Hello Seekers. - God send signs throughout people's lives to help them perusing their destiny. - Destiny road isn't all nice and fair, sometimes a hurricane and thunder be-follows the Rainbow shiny skies. - Advice to the people in your circle, not everyone will be happy with your progress, eliminate the bad and keep the good. - Higher circles of learning is where the growth would be and smaller circles of experience sharing is where knowledge exchange takes place, share your wisdom and learn. - Never get satisfied with your current level of achievement whether financially, academically, or spiritually, there is always a better and deeper level of Relationships that we can evolve with greater understating and true commitment to our destiny. - Couple starts went missing from the book for the same reason any writer happens to fall on that is the redundancy of the idea and the narrowed creativity perspective. All in All it's definitely a great read for anyone who would like to ignite a burning soul towards achieving greatness and make the World a better place. This book was excellent, full of insight, and examples of life experiences. Truthfully, at a certain point, there is a disparaging accusation in which a teacher (may) ridicule someone, and that's when I returned the book. Instantly. I was disappointed that had to be an example because being a teacher, and having many teacher friends, we simply do not ridicule our students. Quite the opposite: we dedicate our lives to our students; we teach and encourage them. I'm tired of hearing ugly comments a This book was excellent, full of insight, and examples of life experiences. I was disappointed that had to be an example because being a teacher, and having many teacher friends, we simply do not ridicule our students. Quite the opposite: we dedicate our lives to our students; we teach and encourage them. I'm tired of hearing ugly comments and untruths about teachers... we endure it constantly from "parents" and members of the public. I don't want to hear it from a man I held in high regard. He lost this reader instantly. For any person of faith that is willing to put in the work to realize their destiny in life, this book is written for you. It encompasses different phases in life and provides the much-needed tonic for people who are at that decisive point which separates success from merely existing. This is vintage T.D. Jakes providing admonishment, inspiration, advice, and anecdotes in equal measure. There is something for everyone and a situational analysis of life, and what can be made out of it - A destiny For any person of faith that is willing to put in the work to realize their destiny in life, this book is written for you. It encompasses different phases in life and provides the much-needed tonic for people who are at that decisive point which separates success from merely existing. This is vintage T.D. Jakes providing admonishment, inspiration, advice, and anecdotes in equal measure. There is something for everyone and a situational analysis of life, and what can be made out of it - A destiny filled life. "No one can take your place to fulfill your destiny. This is your life. No rehearsals. No retakes. No delete button." Destiny by Thomas Dexter Jakes is a great eye opener for all us yearning to live life the fullest. It embeds in it the how to pursue your destiny, the why you have to and the methods to keep you going when all hell seems to be breaking loose. Please don't misunderstand my rating to mean I didn't like this book. There were even some passages that I shared with my family. However, I feel like I could sum up Bishop Jakes' recommendations in just a few words. Find your destiny. Pursue it passionately. Don't be deterred. Work hard. Set priorities. Expect barriers. Be patient. He provides some very interesting examples of historical and modern figures who have realized their destiny along with splashes of personal experience. Not a bad rea Please don't misunderstand my rating to mean I didn't like this book. There were even some passages that I shared with my family. An excellent book, and one of my favorites by this author. This gem is full of good sense, wise words and faithful directions. Truly an educational reading opportunity that discussing the challenges and choices we face each day. I am Currently reading it again from chapter 6, as the author suggests. An enjoyable read that would fit well into any home library and make an excellent gift to someone you love. Excellent book, a must read for anyone reflecting on their purpose in life, how to follow the voice that calls you to do more. I jumped into this book on a recommendation from a friend, later I found out some people love TD Jakes an some don't. I didn't worry about that and just took in the content. What he has learned and had to share was profound and helping others walk through it was deeply meaningful to me. I was gifted this book as a graduation gift which was 4 years ago. I didn’t have time to read it. After going through a breakup, and getting back in school I thought. Hmm maybe it’s time. This book helped me refocus and get back on track with what I knew I should’ve been doing in the first place. Thank you Bishop. All I can say is outstanding! Wherever you're trying to go and whatever you're trying to do let destiny be your guide and keep this book with you as a road map on the journey! Bishop Jakes has given you an instruction manual for your life; read it, learn it, embrace it, and live it! Your destiny awaits you. This was a great book! Hugely inspiring, convicting and motivating. If you need something to encourage you along the path of living out your God given destiny, this is a GREAT choice! Favorite Quote: "If you're not living your destiny as you journey you won't be able to live it after you reach your destination." This book is full of affirmations and stories of five women who lived in biblical times. These women went through many challenges and was able to preserve to pursue their destiny. A great book to read daily to motivate one for their day. After watching T.D. Jakes on Super Soul Sunday w/Oprah Winfrey I was hooked! I loved his message and delivery so much I YouTubed some of his sermons! Then I HAD to order his books! They didn’t disappoint! I Highly Recommend!! I'm not going to say anything extravagant. All I'm going to say is, if you allow this book to help your perception and are open minded, it will help you be susceptible to what God has planted in your heart to chase. Establish order, and go get your Destiny. This is what I know...Bishop T. D. Jakes does it again! If you need help getting to the next level and unlocking your potential, this book is a must. It is an easy to read guide, giving insight and instruction to the reader. You will definitely be motivated to step into your destiny!